The website at www.hillsborough.net/ shows a seal in a circular format with the outer ring in blue. The upper half of this outer ring contains the words 'TOWN OF HILLSBOROUGH' in white block lettering, with some sort of indecipherable device at the center dividing the upper and lower halves of this outer ring; the lower ring contains the word 'INCORPORATED' and the date 'MAY 5, 1910' similarly written at the bottom. The central image consists of a landscape framed entirely by two large trees with dark brown trunks and dark green branches; there is also thick shrubbery in dark green at the base of this image. These trees frame a range of ocher hills with gray green contour lines, and over all a white sky. Rachelle Ungarettio, the City Clerk, informs me that the two trees depicted on the seal are an oak and a bay tree, respectively [Note: this latter is sometimes known as a laurel tree]. Both varieties are common in the vicinity of Hillsborough. Also, the hill depicted on the seal is actually Black Mountain, at 730 feet the highest point on the south San Francisco Peninsula. The seal itself was designed by an unknown source in 1910. 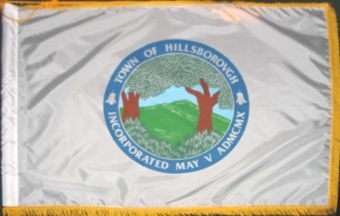 The Finance Committee of the Hillsborough City Council reported at the Council meeting of 16 May 1910 that a City Seal was in preparation, but no further details were given. At the next Council meeting, on 19 July 1910, the design was presented and adopted. In November 1917 Hillsborough changed its status from a city to a town and the seal was accordingly amended; there have been no subsequent modifications. Rachelle Ungaretti, the Town Clerk of Hillsborough, California, informs me that she has discovered that Hillsborough does in fact have a Town Flag; it is rarely displayed and she does not have an image of it. The flag consists simply of the town seal on a rectangular field.